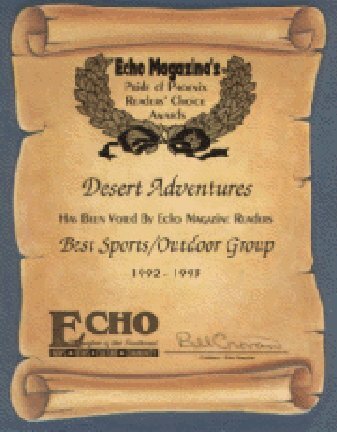 Desert Adventures was founded in March of 1980 by a group of people who got together one night for dinner and found themselves discussing the need for an alternative and better way to meet people and socialize, other than the bars. From that meeting arose Desert Adventures, an organization designed primarily to provide camping and hiking activities for members of our community. Since that time, Desert Adventures has expanded its activities to include various indoor and other recreational activities as well. Desert Adventures is strictly a volunteer organization drawing from the talents, time and efforts of its members to organize and lead trips and activities. Some of the regular camping trips sponsored include trips to the Grand Canyon, Long Valley, Havasupai, Mount Lemmon, and other campgrounds, lakes and recreational areas within Arizona, California & Utah. Desert Adventures also schedules trips to such places as Mexico, Wineries, Live Theatre, Tucson and other non-camping attractions, as well as day hikes to the mountains and recreational areas in close proximity to Phoenix, The pleasure we derive from Desert Adventures is only limited by the time and energy our members are willing to contribute to the club! Our quarterly members parties offer the opportunity to get together for recreational-type activities, socializing, and of course sampling each other's favorite recipes. The annual DA Holiday Party and our Thanksgiving dinner party are always very popular. "Game Days", movie nights and theme parties are also scheduled to accommodate those who are not avid outdoors people, or who are unable to attend weekend functions. Membership is open to all gender identities, 21 years of age or older, for an annual fee of $25.00. This membership fee includes free attendance to the quarterly members parties and a weekly email blast. All Desert Adventures sponsored trips and events require a "trip fee", ranging from $1.00 to $15.00, to cover administrative costs - plus any other related fee(s). NOTE: This is a historical document and is presented here to document the club's past. Some of the meetings, events and activities are no longer offered, however we are always open to reviving them. If you are interested in leading a trip click here. Twenty years doesn’t seem like a long time, but it is when you are trying to coordinate fun and adventures for people with different backgrounds, different ages, different professions and just plain different personalities! Eight people started this club on March 11, 1980, and named it the Gay Activities Group (GAG). Thank goodness for one of our founders, Tom R., who renamed it Desert Adventures! At the same time, we chose the Father Sky Yei, which symbolizes health and prevention of disease, to represent the club. We registered both the name and the symbol with the State of Arizona to claim them as our very own. During the first four years, we were affiliated with a national group called "Great Outdoors". In 1985, we took the plunge and ventured out on our own to provide a wider selection of activities for our members where we could enjoy the beauty of Arizona. That same year, we changed the name of our newsletter from The Happenings to The Trailmarker to emphasize our outdoor interest. In 1990, we decided to incorporate and were approved as a non-profit tax-exempt corporation. Since that time, we have increased our membership to over 330 members and now schedule activities for every week of the year. Over these 20 years, Desert Adventures has hosted a multitude of varied activities. Our Activities’ leaders have scheduled these events based on requests made directly from our membership. We have camped in Arizona/California/New Mexico/Colorado/Hawaii/Utah/Rocky Point, roller skated (with varying degrees of ability) in several rinks in Phoenix, rode horses on the Valley trails (also with varying degrees of experience), tubed the Salt River, and toured museums/mines/theaters/historic sites. We have hiked the valleys, deserts and rooftops of Arizona, attended movies and plays, “ooh’d and aah’d” at the spring wildflowers, partied at the many backyard members’ parties, cruised Canyon Lake on the Dolly Steamboat and bused to Nogales for shopping. We have also gambled in Laughlin and Las Vegas, watched the fireworks burst in the air on July 4th, experienced the Renaissance Festival and walked the hillsides of Jerome and Bisbee. We have tried to ski the slopes, showed our pride at the rodeo and Pride festival, rode in various railroad cars, rode our favorite rides at Disneyland and Disneyworld and rode our bikes through streets and washes. We have bowled strikes and gutterballs, given thanks at Thanksgiving, exchanged memorable gifts at Xmas In July (and the White Elephant exchange), rung in the New Year and 4-wheeled through the dust. We have floated down the Colorado River, watched the sunrise from hot air balloons, visited the zoo, dressed for Halloween, played in the water (in pools, lakes and the ocean) and played sleuth at murder mysteries. We have enjoyed the winter by walking through the zoo lights, by bouncing on a hayride wagon and by enjoying the annual Holiday parties lead each year by our officers where we anxiously anticipated the surprise Holiday gift (and the visit from Santa). We have annually revered the splendor of the Grand Canyon (going camping at the Grand Canyon was my own first trip and it remains my favorite trip) and, through it all, ate enough to bring us all back for more!! Next month we will bring you a special report on “Who Are the Members of Desert Adventures?” If you have wondered how many men and women are currently members, what professions are represented, what is the most common name, when did our members join and where do our members live, be sure to catch the next issue.